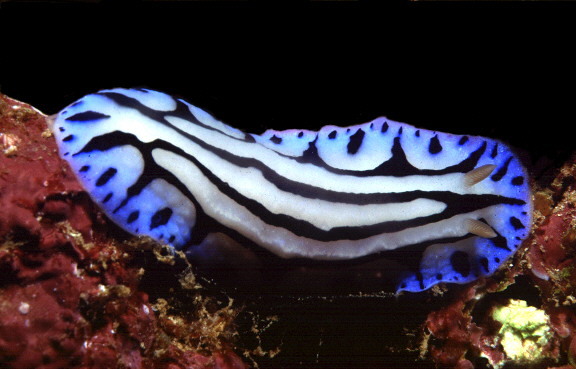 This attractive phyllidiid was first pictured by Bertsch and Johnson (1981) as "blue-black" Phyllidia in their diving pictorial book "Hawaiian Nudibranchs". Detailed study of several more specimens from 25 mm down to 4 mm in length showed that it belonged in the genus Phyllidiopsis. This genus is difficult to distinguish from Phyllidia on external features alone, however the most telling attribute externally are the oral tentacles which are fused in Phyllidiopsis but not in other phyllidiid genera (though partially fused in Ceratophyllidia). Phyllidiid genera show very considerable differences in their gut morphology, showing radiations or adaptations for 'sponge sucking'. While most specimens of P. sphingis are known from Hawaii, this species has also been collected around Madang in Papua New Guinea and in Guam waters. Little else is known of its habits or life history, although it probably feeds on an axinellid sponge. Another blue species is known from the Indian Ocean (Thailand) , Phyllidiopsis annae, however it has 3 blue ridges and a blue mantle skirt and black rhinophores. Phyllidiids with their lumps, bumps, ridges and bright colours often give the image of tiny monsters; hence, P. sphingis was given the fun name derived from the Sphinx - the mythical monster at Thebes who posed riddles for the people passing by and consumed them if they could not answer!